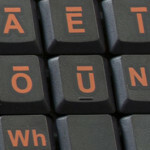 The Māori Language Keyboard has been designed to assist with the use and growth of te Reo Māori. The Māori language keyboard is very easy to use. It has been designed with two ways in which to add the macrons to vowels. The first way is the macron add key which is located to the side of the two shift keys – to add a macron hold this key down and then press a vowel key. The second way is to use the direct access keys located on the right hand side of the keyboard. Move the mouse pointer to the top right corner of the screen and a side menu will appear. Click settings just below where you typed. Click add a language again. Click Maori and then add. Click Reo Maori in list and then click- move up to make it the primaty language.